Custom aquarium stands can cost hundreds if not thousands of dollars depending on the size, materials, and features included. The good news is that you can easily build an amazing fish tank stand using basic power tools, quality components, and of course, the finish of your choice. Let’s get started! If you don’t have power tools, consider borrowing them or renting them for the weekend. The sky really is the limit here! You can build basic aquarium cabinetry with 2x4s and plywood. If you enjoy rustic cabinetry, you might want to consider recycling some pallet wood for use on the exterior. You might even want to take a shortcut by purchasing pre-fabricated cabinetry (either finished or unfinished) and building a strong, reinforced frame inside. ¾” plywood, amount depends on aquarium stand size. Note that plywood comes in different grades. Choose one with a wood grain that appeals to you, and that fits your budget. Unfinished cabinet door(s) in wood to match your plywood (pine is a versatile choice). Note that you can make your own cabinet doors if you like, and if you have the carpentry skills to do so. You’ll probably want to make your own doors if you are going for a rustic look! 2 overlay hinges per cabinet door. If you’re a fan of rustic interiors, you might consider barn door style sliding door hardware instead. We’re using standard overlay hinges, but this is a fun option that can give your custom aquarium cabinetry a unique look! Decorative trim for the cabinet’s edges (optional). Trim can conceal a multitude of design flaws, imperfect cuts, etc. It comes in many sizes and shapes, and it’s inexpensive. It’s a good idea to choose an unfinished wood trim for this project so that you can finish it with the same stain and/or polyurethane that you’re using for the rest of your DIY fish tank stand. The first step to building a DIY aquarium stand is to measure the base of your fish tank. 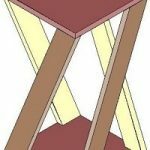 Determine if you want to build a stand with extra space for items on top, or if you’d rather build a stand that supports the aquarium alone. Next, decide how much space you need for items inside the aquarium stand. How large are the accessories that will be hidden inside the cabinet? You’ll want to give yourself plenty of room to maneuver air lines, pumps, and other items. If adding a sump tank underneath, you’ll need to take this into account when designing the interior. Decide if you’d like to build a hood. This DIY aquarium cabinetry project does not include plans for a hood, but you can easily draw up a design by looking at hoods sold with commercial aquarium stands, and you can incorporate that design into the plans. If you build an aquarium canopy, be sure to take ventilation and lighting into account. For the exterior cabinetry, you can simply use the same finishing steps that you’ll be using to complete the rest of the project. 1. After taking measurements and drawing a design that appeals to you, cut 2×4 lumber into appropriate lengths. Build a sturdy frame with cross-bracing on top and inside the bottom, preferably at 10-inch intervals. If you are leaving the back open as is customary, consider adding at least one removable brace to give yourself some additional peace of mind. Use coated deck screws to assemble the frame. 2. 4. Cut ¾” plywood pieces for the aquarium cabinet’s top, sides, and face frame. If you are adding any pieces to the back, cut these too, along with any pieces you’ll be using for interior shelves. 3. Lightly sand the 2×4 frame and the cabinet components including doors and trim. 4. Vacuum your work area after dusting the sanding residue off the frame and cabinet pieces. Lay down drop cloths, plastic sheeting, or tarp to protect your work area, and lay your components out. We recommend finishing the back sides before moving on with the front sides. 5. Wipe the wood with mineral spirits and then apply a coat of marine grade polyurethane to the entire 2×4 frame and the interior surfaces of the plywood cabinet components. Note that you shouldn’t skip this step, even if you are using pressure-treated lumber. Coat the entire surface, even though it’s going to be hidden by the aquarium cabinet’s exterior. 6. Let the polyurethane dry according to the manufacturer’s instructions before moving on to the next step. Many brands require 24 to 48 hours between coats. 7. When the polyurethane is completely dry, flip the cabinet components over to expose their faces. If there are any polyurethane drips, sand them off and then wipe the wood down with mineral spirits before proceeding. 8. If you are staining the cabinet components, apply the stain now. You can stain your trim at the same time. Let the stain dry according to the manufacturer’s instructions before moving on to the next step. 9. Apply a coat of marine grade polyurethane to the stained surfaces. Allow it to dry according to the manufacturer’s instructions. 10. Sand all components with 320 to 400 grit sandpaper. 11. Vacuum and wipe all surfaces on your project and around your work area. Use a little bit of mineral spirits during the final wipedown. This will remove any remaining dust. 12. Apply a second coat of marine grade polyurethane to all surfaces. This might be enough, but do repeat steps 10 and 11 if the manufacturer recommends using a third coat of polyurethane. 13. When you’ve completed the finishing on all components, let the polyurethane cure for at least 48 hours. This way, everything will be completely dry and ready for the final assembly steps. 14. With the brad nailer and corresponding fasteners, tack the aquarium cabinet face plate, sides, and top into place. Add inner shelves and back components if you are using them. If your custom aquarium stand is large and heavy, you may want to complete this step in the room where you’ll be setting up the aquarium. 15. Attach the cabinet handle(s) to the door(s). 16. Attach the cabinet hinges to the door(s), and then attach the door(s) to the face plate. 17. Move your aquarium stand into place and set it up. Enjoy! How Much Time Does It Take to Build a DIY Stand for a Fish Tank? Building a DIY stand for an aquarium isn’t difficult. However, it takes several days, not because of the amount of work involved, but because marine grade polyurethane takes a long time to dry. Give yourself at least a week to complete this project. It can be frustrating to wait, but your finish will be durable and waterproof. Once it is in place, your custom aquarium stand will last for years to come. What is the Average Cost to Build a Custom Aquarium Stand? The cost of this project depends on the materials and finishes you use, as well as the size of your fish tank. Expect to pay more if you decide to build a custom hood with lighting. While this project is probably going to cost at least $100 if not a bit more, you’ll ultimately spend far less than you would on a similarly sized aquarium stand, particularly one that has been made to order. Depending on your woodworking skills, you can add components such as inlays and veneers, drawers, and other details to make your aquarium stand even more impressive! Many people who have successfully built DIY aquarium stands have done some research by visiting a store where commercial stands are sold, looking at the interior features, and deciding which of these features to incorporate in their own designs. This is an excellent strategy. There’s no need to completely reinvent the wheel when designing a custom aquarium stand. Same principles can apply when building a plywood terrarium. Terrarium stand requires less strength and there’s no need to carry a large mass of water. 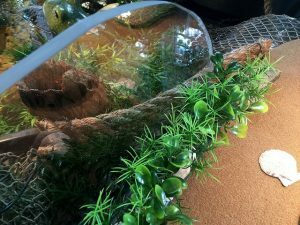 However, when building DIY terrarium or vivarium it is necessarily to take care about type of plywood and treatment you’re using as some reptiles and insects could have health issues. We recommend focusing on strength, waterproof integrity, and an exterior design that complements your home in terms of finish, hardware, and other decorative elements. With careful measuring and a touch of creativity on your part, you’ll soon find yourself enjoying a beautiful custom aquarium stand at a cost of hundreds or even thousands less than a commercial model.